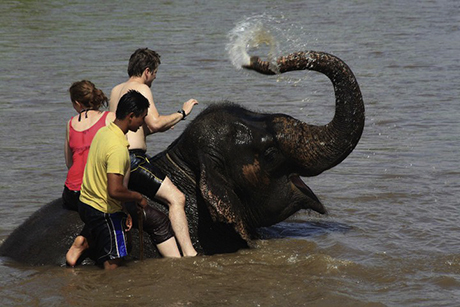 The first elephant camp in Thailand where guests can ride elephants without a seat. Thom's Elephant Camp was the first elephant camp in Thailand where visitors could ride elephants without a seat, play with them and swim together in the river. 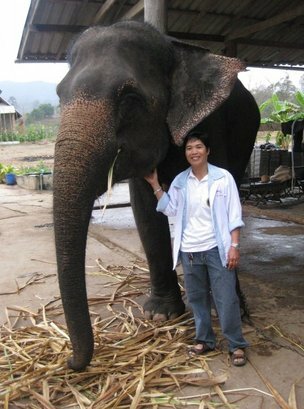 Thom grew up with the elephants, played with them as a child, and knows how much fun it is to spend time with these wonderful animals. 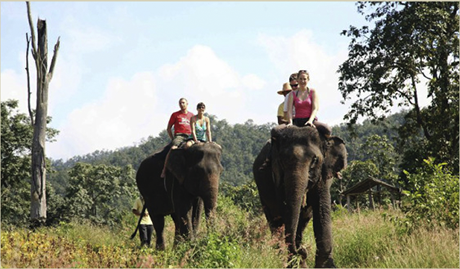 The camp is recommended in many guidebooks, and in addition to elephant trekking they offer Mahout (elephant trainer) courses, bamboo rafting, sightseeing tours, hill tribe visits, and flexible combinations of these activities. You can also get married on an elephant's back! The camp has hot tubs with natural hot spring water piped directly from Tha-Pai Hot Springs. After your ride you will receive a DVD of your day's activities and a CD full of photographs so that you don't have to worry about missing a shot! The course starts with an introduction to elephant health care and basic commands to control an elephant. 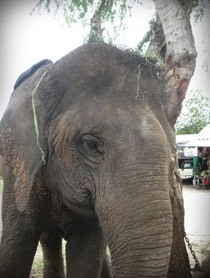 You will learn the verbal and body language to communicate with the elephant followed by hands-on practice. Moreover, you have the chance to take full care of the elephant, including bathing, feeding and other every-day activities. 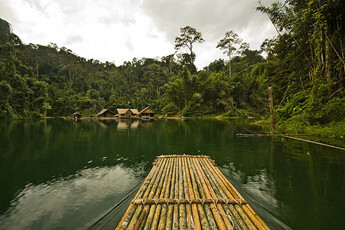 Our bamboo rafting trips are a great way to see more of everyday rural life in the countryside of traditional Thailand. As you float along the Pai River with your guide, you can see the local farmers at work, children playing on the river banks, as well as wildlife and birds in the area.Traveling by traditional bamboo rafts means that you can enjoy your trip without disturbing local people with noise, polluting the river, or damaging the environment. Our popular one-day tour combines elephant riding in the morning and bamboo rafting in the afternoon, and includes lunch at the camp, bathing in our hot tubs, transportation and insurance.You're sure to have a fantastic day out! Ot is a very friendly and playful elephant. She’s Thom’s favorite, her best friend and 30 years old. Ot loves to eat all the time, especially fruit and greens. She plays football, plays the harmonica, splashes you if you're hot, says "thank you" when asked, and loves to be loved! Tutdao looks like the super star of this camp. If you have a look at her eye-lashes, you will understand the name. Although she is only 20 years old, she’s the biggest lady out there. Tutdao is very playful and walks beautifully. Tutdao has a very playful and positive attitude and it shows with how she interacts with people, she has to be the one with the most humor! 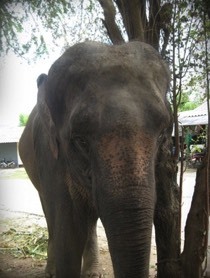 Pom Paem is the smallest lady of the camp, but she will not grow any more, though she loves to eat a lot. She is already 23 years old. Pom Paem is really playful and friendly. 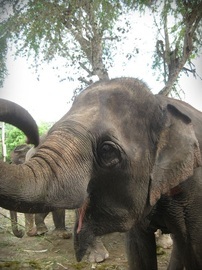 Mahout Training Course: Begins with an introduction to instructions (more than ten) and elephant care. Verbal and body language to communicate with the elephant followed by hands-on practice. 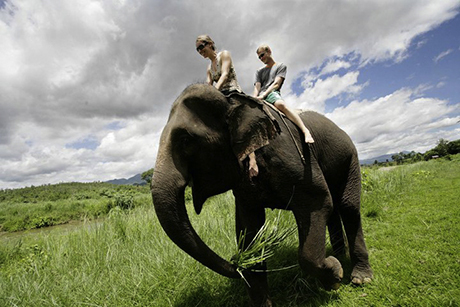 • One and a half hours elephant riding through the mountains OR Bathing with the elephants.